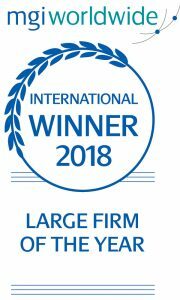 Selden Fox is proud to announce the firm has been named the winner of the MGI Worldwide 2018 Large Firm of the Year Award at the prestigious MGI Worldwide Awards, which took place in San Francisco, California in October. The award was presented to the firm at the MGI Global meeting and gala dinner which brought together 100+ delegates from MGI firms from across the globe. Selden Fox has been a proud member of MGI for nearly 10 years. The MGI Worldwide Awards celebrates the exceptional standard of work among member firms and recognizes those firms that have gone the extra mile to make their membership and involvement in MGI a true success. Criteria for the Large Firm of the Year award included more the $6.6 million in revenue; a firm that has: made special efforts to benefit from its MGI membership; made investments in time and resources to engage with MGI firms; developed business with other MGI firms; promoted MGI and its brand; successfully grown business and MGI brand; and worked in the MGI management. MGI Worldwide is a leading international network of independent audit, tax, accounting and consulting firms with more than 5,000 professionals in 260 locations in 88 countries.